Given the record of frosty relations with Prime Minister Netanyahu, President Obama’s parting shot at Israel comes as no surprise. After years of standing up for Israel at the UN Security Council, the US has abstained from a resolution that, among other things, “reaffirms that the establishment by Israel of settlements in the Palestinian territory occupied since 1967, including East Jerusalem, has no legal validity and constitutes a flagrant violation under international law and a major obstacle to the achievement of the two-State solution and a just, lasting and comprehensive peace.” The resolution was framed by the US as intended to salvage the last vestiges of hope for a two-state solution in a situation where, as US UN Ambassador Samantha Power noted in her speech following the vote, there are 590,000 Israelis living on the West Bank. She also noted that Israel’s Netanyahu’s claim to still be pursuing a two-state solution contradicts his stated policy of being the most pro-settlement government in Israel’s history. As a hard leftist, Obama, like other Social Justice Warriors, could not possibly support Israel’s ethnic cleansing, apartheid, and oppression of the Palestinians in good conscience. The same thing has happened with other parties of the left, notably the Labour Party in the UK. In taking this position, Obama is out of step with the predominantly Jewish donor class of the Democrats and with Democrat politicians, many of whom condemned the resolution, likely with the understanding that they must still deal with AIPAC if they want to be reelected. But it is unlikely that his action will be condemned by a very substantial percentage of the Democrat Party’s base — only a bare majority of Democrats favor Israel (53%), compared to 23% for Palestinians. The fact that Obama did this a month before leaving office is a powerful statement of the power of the Israel Lobby and pro-Israel sentiment in American politics. It would have been suicide for him to have done this prior to the 2012 election. Should this position disturb those of us on the Alt Right who see Trump as a president who would carve out an America First foreign policy, turn back the immigration onslaught, and fashion a nationalist trade policy? I think not, for the following reasons. 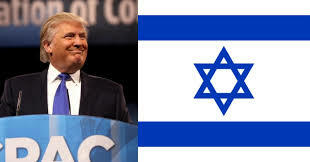 During the campaign, Trump did several things not at all to the liking of the Israel Lobby, including his statement to the Republican Jewish Coalition that he was not beholden to their donations and his statement that he would be neutral in dealing with Israel and the Palestinians. However, Trump mended the fences in his well-received AIPAC speech, although he never appeased the #NeverTrump neocons who continued to denounce him from their perches in the mainstream conservative media. Nevertheless, since winning the presidency he has signaled strong support for Israel, appointing David Friedman, a hardline settlement-supporter and opponent of a two-state solution, as Ambassador to Israel. Trump has also promised to move the U.S. Embassy to Jerusalem, a move long sought by Israeli hard-liners. And he previously signaled that Israeli settlements are not an obstacle to peace. Trump is not in Obama’s position. As president, he must govern with the cooperation of the mainstream Republican Party and its representatives in Congress. In the same poll cited above, Republicans favored Israel 79%–7%, implying that coming out against Israel would alienate a large majority of the GOP base just as he is beginning his term as president. A pro-Israel foreign policy is completely ensconced in the Republican Party. Following the vote, it was condemned by a chorus of Republican politicians and ex-politicians, including House Speaker Paul Ryan, senators Tom Cotton, and Lindsay Graham, Newt Gingrich, and Mike Huckabee, with nary a contrary voice. In other words, Wilders, like Trump, has carved out a position that favors Likud-like positions on Israel while at the same time is opposed to further Muslim colonization of the West. Trump has not backed down from his statements that he will attempt to have a moratorium on immigration from terrorism-producing countries (i.e., Muslim countries) and will not accept refugees from these countries without “extreme vetting” (which I take to mean such refugees would not be admitted to the U.S., since it is not possible to properly vet people from Third World countries, which, for a variety of reasons, tend not to have adequate record-keeping). Although Geert Wilders‘ support for Israel has been long-standing and probably sincere (he lived in Israel for two years as a young man, working on a kibbutz, and has visited the country 40 times in the last 25 years), he has been unable to form a government and, given his recent conviction, he obviously has not achieved acceptance among elites in the Netherlands. However, his popularity is on the rise — he is now the most popular politician in the country, and his popularity increased following his conviction, to 36%, the highest of any party (but still far short of a majority). With the success of Trump and continued examples of Muslim terrorism, it is conceivable that he could actually win. I can’t prove it, but it seems to me that a main motive of Wilders et al. is to provide cover from the left that is dominant in the media but also sympathetic to Israel and Jewish concerns generally. Trump has been viciously attacked by the mainstream media — not only the powerful left-leaning media, but also including the neoconservative media (which is nothing if not pro-Israel). And because attacks on people like Wilders and Trump tend to be framed in moral terms — a sense of moral righteousness is the opium of White people — many non-Jews in the mainstream right seek legitimacy and acceptance by supporting Jewish causes. After all Jews have successfully portrayed themselves as the ultimate victims and are well-known to be leaders in “anti-racist” causes throughout the West. Conservatives see this as an effective response to incessant charges from the left that Republicans, and especially Donald Trump, are basically White racists pretending to be dedicated to principles. This draws on moral capital that Jews have piled up via incessant media accounts of the Holocaust and media accounts portraying anti-Jewish attitudes as irrational ravings of uneducated, morally defective people. The left long ago realized the power of appeals to moral righteousness and its unique appeal to White people. (I have proposed that White people, and especially Northern Europeans, are uniquely prone to forming groups based on a sense of moral righteousness [as opposed to clan-type kinship connections], while ostracizing and vilifying those who stray from the moral consensus.) The right has been slow to reciprocate, often grounding their arguments in abstract principles like states’ rights, economic liberalism, and Constitutional arguments. Libertarianism grounded on abstract notions of human liberty is a paradigm. But grounding support for Israel in moral righteousness is increasingly threadbare given Israeli ethnic cleansing, apartheid, everyday oppression of the Palestinians, and regular outbursts of incredible brutality in Gaza. Nevertheless, by supporting the key Jewish concern of Israel, he is not only squarely within the Republican mainstream, he is also deflecting the “Trump as Hitler” mantras we see regularly in the mainstream media. Politics, after all, is the art of the possible. For us as advocates of a White America, our first priorities should be domestic policy — ending the immigration onslaught first and foremost. If doing that is made easier by supporting Israel, so be it. THROUGHOUT MUCH of his adult life and childhood, at seemingly every significant juncture in his business career, Donald J. Trump has surrounded himself with members of a single minority group. … Trump seems to have something of an affirmative prejudice toward Jews. They believe he considers Jews a group of rich, smart, successful and generally powerful deal makers – all traits which Trump himself aspires to, and has sought to emulate. Beginning with his father Fred, Trump family has been deeply intertwined with Jews in the real estate business. “My feeling was, ‘I figured out how to use Jews to my advantage.’” I conclude that Trump is certainly not an anti-Semite, but it would be difficult to believe that he is naïve about Jews. I imagine him at business meetings and cocktail parties hearing Jews talk and very positively about immigration and multiculturalism as I often heard them talk back in my days as an academic. The fact that he has used Jews, as Schwartz says, to achieve his goals is no reason not to think that he understands that the goals of the mainstream Jewish community in America are far different from his. And he surely realizes that there was a tsunami of Jewish money funding his opponent in this election and that around 75% of Jews voted for Hillary. He understands that Jews are very powerful and influential in American life. And given that, along with the attitudes of the GOP base, he is well-advised to chart a pro-Israel course while at the same time seeking to Make America Great Again by radically changing policies on the home front related to immigration and refugee policy first and foremost.